Last week I visited the beautiful zoo in our city. Besides enclosures for elephants, penguins and tigers, there is an extraordinary Madagascan rainforest hall. You can walk through this little exotic world on small foot paths and see flying foxes as well as cute little monkeys. There are benches to sit under big palm trees, while you hear the sound of a waterfall and exotic birds. The probably best thing about this hall are the always tropical temperatures. Especially when the long anticipated spring still hasn't arrived yet, it's the perfect place to go. The zoo visit inspired me for this post about tropical fashion. Clothes with exotic prints and accessories shaped like jungle plants are coming back nearly every spring or summer and I never get tired of them. There seems to be a desire for the mysterious jungle life with its bright colours and amazing plants in all of us. Dressing like a jungle girl is a wonderful way to cheer up. I especially like the jungle shirt from Fairgound, you can wear it as a dress as well. I think it would look cool either with the necklace from Tatty Devine or the fascinator from Pearls & Swine. Dressed like this, I would forget about the cold weather and wait for my Tarzan to arrive and take me with him to an exotic world. 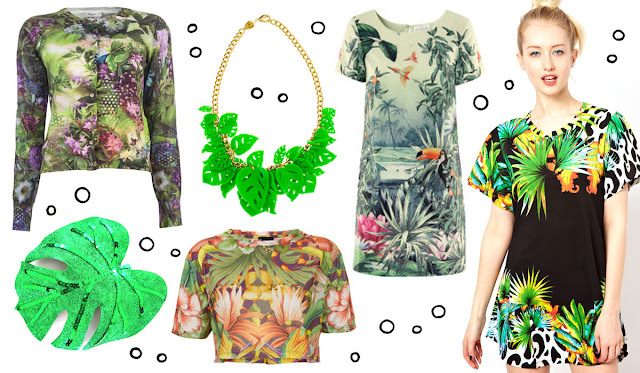 Do you like jungle inspired fashion too and which of these pieces is your favourite? was für ein faszinierender Fascinator! I love it and I will be wearing some vintage pieces soon. I don't usually wear prints, but I might just cave in this season ;-) And such pieces look really fantastic on YOU! :) You're already owning the leave fascinator, aren't you? Ich kann mir gut vorstellen das Du ein Hammer Outfit daraus machen würdest oder wirst ;-) Und den Fascinator sehe ich sowieso an Dir! It is darling and designed very well.I am always love leather hobo bags, like these on cwmalls.com. Hope you share more great items.